This year, I reflected long and hard for my one-word battle cry for 2018. As I was sitting in meditation on the first Friday of the year, the word “vulnerable” came to me. Perhaps, it was because I started the year reading two Brene Brown books. But maybe it was because the end of 2017 was a vulnerable time for me. For the first time in my life, my blood pressure hit 160/90 on December 15th, one day before my parent’s 50th wedding anniversary. It was a shock for me, as I thought I had already regained my health after losing 25 pounds. But with hypertension on both sides of my family, high stress, and not getting enough rest it happened. My blood test results were normal, and my ECG showed I had a heart of an athlete. This means my exercise and food intake were on point, but not my stress. My cardiologist said, “It’s bound to happened with both sides of your family with hypertension. It comes with age, too. You’re 42.” I was blaming myself for it. 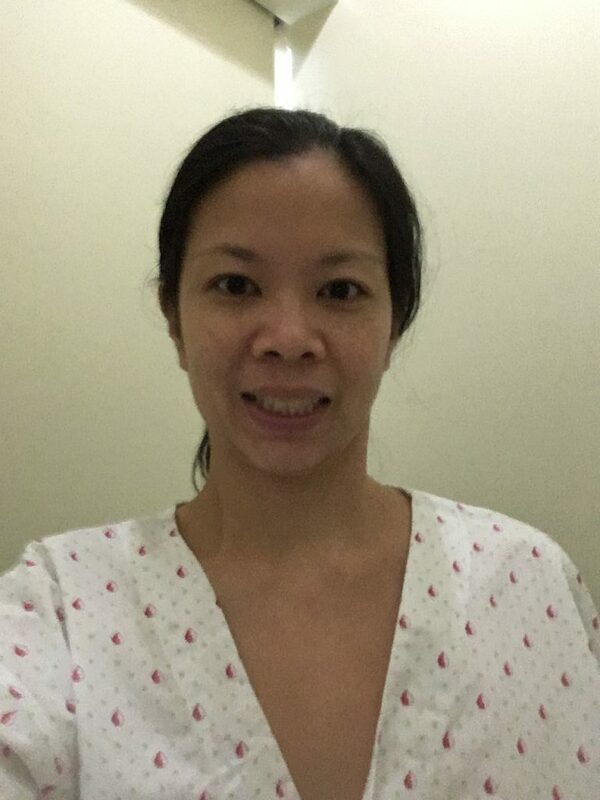 Then he said, “Accept it.” I reached out to Francis, my doctor friend in Singapore. He told me that I am now married to my maintenance medicine, what my dad calls a tiny tickle dose (only 8mg) to keep my blood pressure normal. Francis also told me to religiously check my blood pressure every single day. I took those lessons to heart. But December also came with a pain in my leg and muscle spasm in my neck and shoulder area. 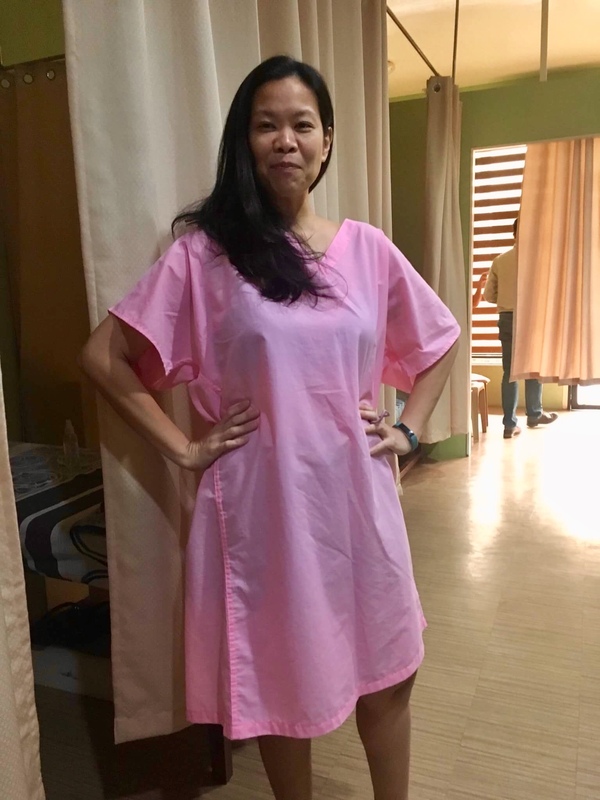 So with several doctor’s visits, x-rays and tests, I learned nothing feels more vulnerable than wearing a hospital gown. I still feel uncomfortable wearing one, but who knows maybe one day I will have the courage to rock it. I’m not yet there. But I’ve gained much respect for the power of vulnerability. But I have made lifestyle changes too. I’ve given up coffee since December 15. I do like my cappuccino, and it has been my habit to write with coffee. So on some days, like that dreadful December 15, I had three cups of coffee. For over three months now, I have been without coffee. I’ve replaced it with Green Tea. I’ve paired writing with Genmaicha Tea. And, I’ve been calmer and less anxious with green tea. Green tea has ¼ the caffeine of coffee. I’ve also enforced a “No Tea after 3pm” rule. I don’t take anything with caffeine after 3pm so I don’t have any problems sleeping. I’ve given up pork and beef, and eat mostly chicken, fish, and vegetables. I’ve reintroduced lean beef this week, as I find myself craving beef. But I haven’t touched fast food since December 15th. The only exception has been a soft-shell crab burger. No pizza. No fried chicken. No fries. I’ve become more mindful of my sodium, too. 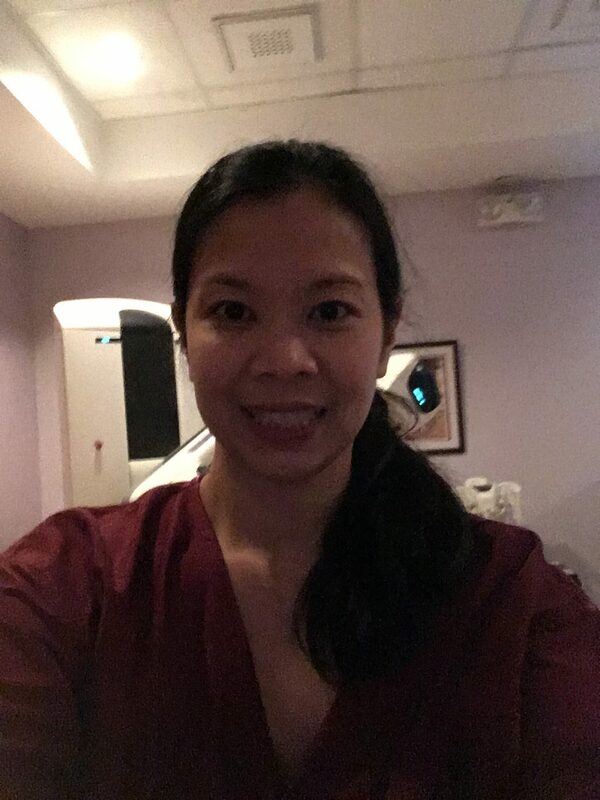 After many visits to doctors, plus the annual mammogram check up and OB-GYN visit and physical therapy sessions, I have become more familiar with waiting rooms and wearing hospital gowns. I’ve found myself talking to other patients (Yes, I’m an extrovert). But I also come accept how vulnerable we feel when it comes to our health. When it comes to pain and illness, there is no rich or poor. We are all human. Create an organized file for your health records. I learned this from my friend Kathie. Her mom is a hospital administrator. When Kathie’s dad got sick, she was shocked to discover a very organized and detailed clear file her mom kept of everything pertaining to her dad’s health. Every single health record was there. I took her cue. I bought a red clear file to put all my lab results, x-ray and test results, and even doctor’s prescriptions. I take detailed notes of my trips, of my interviews, even bank statements, but I have not been diligent about keeping details of my health until now. Note doctor’s visits, when was the first day of your last period (God knows they ask this so often before doing an x-ray), and your daily blood pressure. This will help you give more detailed facts to your doctors, and help them get a clearer picture. Record when you pain and what it feels like. Be a student of your own body. Become mindful of how you feel. Notice aches and pains. Notice how you react to medicines or certain exercises. No one will know how you feel more than you do. Become alert of changes in your body. Become an expert of your body. Be a student of your body! Find the best medical care for yourself. I am lucky to have a daddy who is doctor. He has taken good care of me, with the help of many of his doctor friends all my life. But these days everyone is busy. Doctors included. We all know the drill: the long wait in the doctor’s offices, the brief air time with the doctor and leaving not really understanding what’s going on with you. At 42, I learned you must find doctors who take time to really get to know you and what’s wrong with you. They don’t think you are crazy or paranoid, or shove your concerns under the rug. 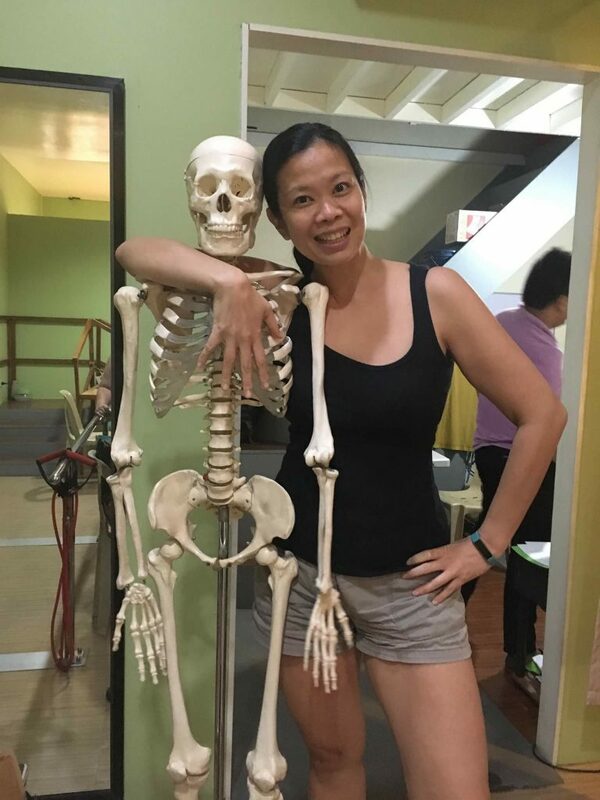 I’ve been seeing the same sports med doctor for my varied injuries from dancing Zumba to yoga to just being clumsy since I began my fitness journey. While he may be surprised at how I creatively injure myself, he still takes it seriously and gives me the best care. I do get better. Find someone who gets you. Who takes time to figure out what’s wrong. Find a doctor who answers your questions and explains things to you. I want to understand what’s going on with my body, so I ask many questions. A good doctor isn’t threatened or annoyed by the questions. In my last conversation with my sports med doctor Dr. Edgar Eufemio, he told me, “My dad (the late Dr. George Eufemio, a surgeon) said a patient should leave being able to explain what’s wrong with them.” That makes a good doctor. If you leave still confused what’s wrong with you, you feel lost. You become more paranoid of your illness. It is empowering to know and get details from a health expert. Don’t ever google your symptoms and try to figure it out yourself. That will freak you out. Yes, I’ve done that. NOT.A.GOOD.IDEA. Get support of friends and loved ones. I live alone and have always been an independent spirit. But after last December, I realized it’s okay to reach out and ask for help from your tribe. I still live alone, but I am blessed to know loved ones who will come and help me when I’m not ok. Even if it means calling late at night, these friends will come to my condo even if they live far. Even if you’re 42, it’s ok sometimes to let your mom come and accompany you through procedures. Yes, you’re a big girl already. But it’s comforting to know you’re not going through this alone. Let your tribe know how you feel and your concerns. Don’t keep the fear bottled up inside. It will make you more sick and anxious. Heal your mind and emotions too. While it’s your body that is manifesting pain, it’s related to your emotional and mental health too. They are all interconnected. I will write a separate post on this. Accept this is your situation right now. It is not a permanent situation. It’s okay to be vulnerable. You will get better. Yesterday, I felt light-headed when I woke up. During my usual morning walk, I felt like I had a bad hangover. Nope, I didn’t have any alcohol or wild night. I had a restful sleep. My blood pressure was lower than usual. By noon, I still struggled to write or work. I called my cardiologist and he told me my body has responded well to the medicine. It was time to lower my tiny dose to half. Today, he told me I am off my medicine. In my books, that’s great news! You are more likely to face these health concerns in your forties: chronic pain (arthritis, back pain, and tendonitis and other painful conditions which increase with age, stress, blood pressure, cholesterol, triglycerides and resting heart levels increase, diabetes, osteoporosis, anxiety and depression, changes in vision and hearing. These are real concerns, which start creeping up on you in your forties. You may be genetically predisposed to them. But there are also lifestyle factors, which you can control. They say life begins at forty! It’s not too late to make changes in your life. Sure, my fitness journey may have started in the gym but it does not end there. Sure, I may have lost weight, started to feel good and look great. But it’s much more than that. The fitness journey goes on to tackling these challenges of aging. It means having a healthy mind, body, and spirit, and that’s what I aspire for. Oh, and one day, I hope to look great in a hospital gown and rock it with a great big smile!